Emory researcher Barbara Rothbaum, PhD, professor of psychiatry and behavioral sciences, Emory School of Medicine,Â and director of the Trauma and Anxiety Recovery Program, has been treating military personnel with posttraumatic stress disorder (PTSD) for more than a decade, helping them to learn how to deal with troubling memories. Through therapy, the service members are taught that by re-living the traumatic event, they can begin to learn how to control the effect those memories have when they surface. Barbara Rothbaum, PhD, demonstrating virtual reality exposure therapy used to help veterans with PTSD. PTSD is treatable and treatments vary from exposure therapy to medication to meditation techniques. Symptoms include reliving the event; avoiding situations that stir up memories of the event; discomfort expressing feelings; being constantly on the lookout for danger; irritability; drinking or drug problems; and employment, social and relationship problems. Many times itâ€™s the family members, friends or co-workers who are first to identify a change in the veteran or service member. Symptoms can arise abruptly and begin to interfere with every day activities. When those symptoms last for more than four weeks, it is likely that individual has posttraumatic stress disorder (PTSD). Rothbaum emphasizes that treatment for PTSD is very effective.Â She encourages active duty military personnel, veterans and others who have been exposed to trauma to seek diagnosis and treatment for problems that persist.Â Symptoms can worsen with time, or cause social and employment problems that complicate recovery, but treatment can help. More information on PTSD is available from the U.S. Department of Veterans Affairs. A clinical trial taking place at Emory uses virtual reality therapy for military personnel who have served in Iraq and Afghanistan and have been diagnosed with PTSD. Emory PTSD research by Dr. Rothbaum and her colleagues is featured on GE’s Healthymagination website. Service members returning from war historically have been haunted by traumatic memories related to combat. Problems can arise when these troublesome memories are suppressed instead of being confronted. The military trains its service members well for combat, but teaching each individual how to deal emotionally with the trauma that comes with it is a challenge that has yet to be resolved. Unfortunately, many of those brave men and women have trouble admitting or recognizing an emotional problem. They tend to believe that avoiding troublesome memories is the best solution and do not come forward for help. Once a service member returns home from a war zone, symptoms caused by haunting memories can arise and begin to interfere with every day activities. When those symptoms last for more than four weeks, it is likely that individual has posttraumatic stress disorder (PTSD). Emory researcher Barbara Rothbaum, PhD, professor of psychiatry and behavioral sciences, Emory School of Medicine, and director of the Trauma and Anxiety Recovery Program, has been treating military personnel with posttraumatic stress for more than a decade, helping them to learn how to deal with the troubling memories. Through exposure therapy, the service members are taught that by re-living the traumatic event, they can begin to handle those memories when they surface. Rothbaum is also a pioneer in exposure therapy using virtual reality software that was developed for both Vietnam veterans and service members returning from the war in Iraq. Military commanders recognize that symptoms of PTSD are not as obvious as a physical injury, but nonetheless just as important, and they are ready to develop programs to quickly identify and treat active duty service members and veterans who are showing symptoms of PTSD before they worsen, says Rothbaum. PTSD is treatable and treatments vary from exposure therapy to medication to meditation techniques. Symptoms include reliving the event; avoiding situations that stir up memories of the event; discomfort expressing feelings; being constantly on the lookout for danger; irritability; drinking or drug problems and employment, social and relationship problems. More information on PTSD is available from the U.S. Department of Veterans Affairs. 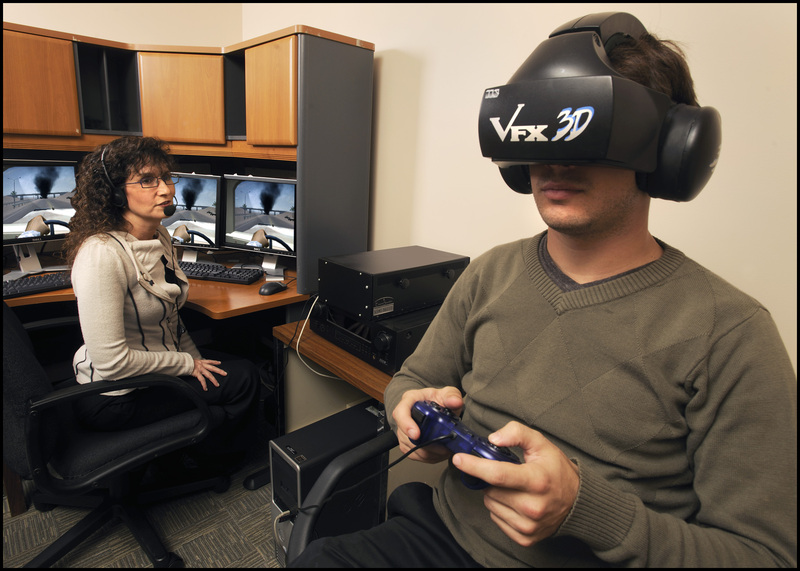 A clinical trial taking place at Emory uses virtual reality therapy for military personnel from Iraq who have PTSD.